A hijacker seized an Egyptian airliner and forced it to land in Cyprus today, but nearly all of the passengers were quickly released and officials said the incident was not linked to terrorism. A government source told AFP the hijacker had demanded to see a Cypriot woman, his estranged lover who lives on the island. 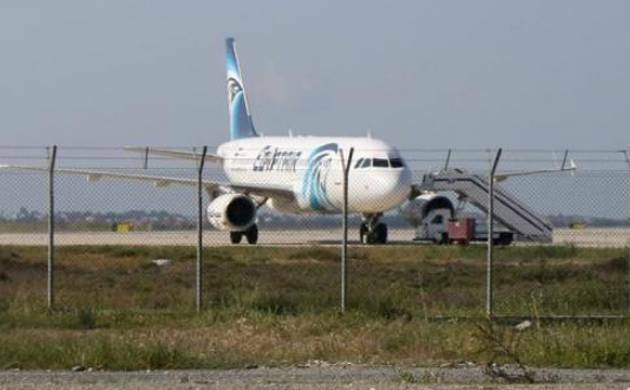 The EgyptAir plane landed at the airport in the southern coastal city of Larnaca at 8:50 am (1120 IST), after the hijacker had contacted the control tower 20 minutes earlier to demand the diversion. Egyptian civil aviation said he had threatened to detonate an explosives belt on the Airbus A-320, which had been headed from the Mediterranean coastal city of Alexandria to Cairo. Most of the passengers were allowed to disembark after the plane landed. Egypt’s aviation minister Sherif Fathy told a press conference that the captain, a co-pilot, an air hostess and a security guard remained on board, along with three passengers. An AFP correspondent later saw at least seven people descend from the aircraft, including some dressed in what appeared to be crew uniforms. The plane had been carrying 21 foreigners including eight Americans, four Dutch citizens, four Britons and a French citizen, an Egyptian civil aviation ministry statement said. Fathy said there had been 55 passengers on board the plane and that the hijacker had demanded it land in either Turkey or Cyprus. “He had no gun or anything. We don’t know yet whether his (explosives) belt is real but for the safety of passengers we are dealing with it as real,” Fathy said. Cyprus President Nicos Anastasiades told reporters the incident appeared to be motivated by personal reasons. “The hijacking is not terrorism-related,” he told a joint news conference with the visiting president of the European Parliament, Martin Schultz. Cyprus’s Sigma television reported that the woman had been brought to the airport from her home village of Oroklini, accompanied by a young child. Cyprus state radio had earlier reported that the man was demanding asylum and had asked for a translator. A crisis team was deployed to the airport, the main entry point for tourists to the Mediterranean resort island.